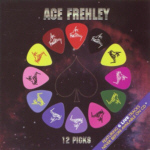 " 2 Originals of Ace Frehley "
Reissued February 6, 2001 as a double pack entitled "2 Originals of Ace Frehley" : featuring the discs "12 Picks" and "Loaded Deck"
Tracks 01 - 06 previously released/ Remastered. Peter Criss background vocals and percussion on "Hide Your Heart" and "Trouble Walkin". Tracks 07 - 12 recorded live at the Hammersmith Odeon, London, England; March 19, 1988. Tracks 01 - 12 Executive Producer, John Regan. Remastered by Tom Brick at Absolute Audio, NYC, NY.